A tasty wood pigeon dish is a comforting rural treat for a cold winter’s day. If cooked carefully, the pigeon’s meat is similar to venison or a rare steak. Some argue that, as wood pigeons often consume large quantities of countryside crops and cause problems for farmers, eating wood pigeon is a good way to do your bit for the rural economy and the livelihoods of local workers. Although pigeons can be cooked whole, the majority of the bird’s meat is to be found at the breast. With this in mind, those in search of a tasty wood pigeon dish would do well to remove the breast and pan fry them as fillets. Plucking a pigeon is a reasonably simple process and you are likely to find that the bird’s feathers come away with relative ease. Once the breast has been fully plucked, take a sharp knife and cut the skin down the centre of the breast bone. Peel the skin away to expose the breast meat. The meat can then be sliced away from the bone. If you’ve opted for removing the wood pigeon’s breast meat, you can have plenty of fun experimenting with a variety of marinades. A simple marinade of olive oil, salt, pepper and crushed garlic can never be faulted. Thyme and rosemary are also delicious with pigeon. Breasts should be lightly fried on a medium heat, until just cooked. Marinating the breasts in simple flavours enables you to get creative with accompaniments and vegetable side dishes. Roast potatoes are delicious alongside marinated wood pigeon breasts, as are honey roasted carrots and roast brussel sprouts. Steamed tender stem broccoli also makes a great pairing. If you’re keen to serve your pigeon with a sauce, an ideal gravy can be made using red wine. 200ml of red wine, simmered and reduced with two tbsp sugar, two sprigs of thyme and six crushed juniper berries is delicious drizzled over gently fried pigeon breasts. Whilst wood pigeon is perfect for a stormy, dark winter’s evening, it need not only be enjoyed in the cold months. Indeed, breast fillets work well on a summer BBQ, seasoned with salt and pepper. Serve with a crispy salad and homemade artichoke crisps. This makes an easy but unusual dish, perfect for those looking to impress dinner guests. Wood pigeons can also be roasted whole. Lightly brown the bird with melted butter and cook for approximately one hour at 200C. Serve with roasted red onions, roast potatoes and steamed green beans. 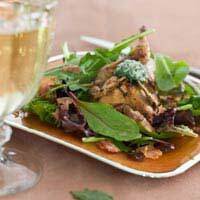 Wood pigeon works well in a warm salad too, fried, sliced and served alongside lardons, potatoes and green leaves, topped with a walnut oil, garlic and mustard dressing. Whilst wood pigeon is ideal dinner party fare, it can also be enjoyed solo. The meat of two pigeon breasts makes a perfect meal for one. Those looking to treat themselves to a delicious dinner would do well to consider getting to grips with the preparation and cooking of wood pigeon.